Carissa-Ann Santos Co-Founder and CMO of Love Grace, an organic cold-pressed juice company established in 2011. Previously a design assistant and model for Betsey Johnson, Carissa turned to holistic nutrition for sustainable energy and ultimate health. 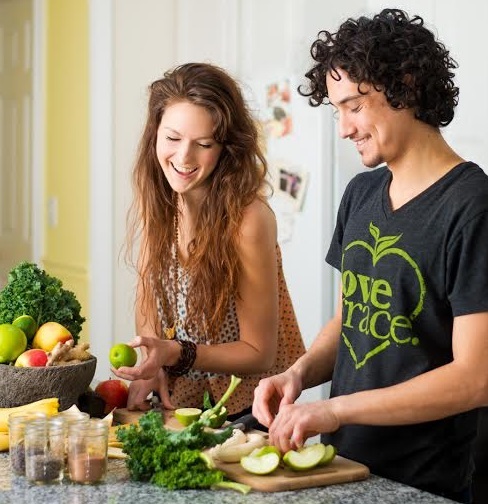 United by the belief that a truly nourished person does the most good her and partner Jake Mabanta created Love Grace as a means to provide grab-and-go real food in the market. Mabanta, a head-chef in some of NYC trending healthy restaurants applied his knowledge of flavors and his love for nutrition to create a line of juices that are unmatched. Expanding daily, Love Grace continues to stretch across the United States reaching more and more retail chains, yoga studios, coffee shops and ships thousands of organic juice cleanses to front doors in the US and Canada. How did you get into the Beverage/Health & Wellness industry? I worked in fashion for a decade. It's a fun wild industry and I was living on lattes. I've always had a tendency towards holistic health and "alternative" medicine from young so when I realized I wasn't taking care of myself I started finding live foods, green juice and superfood smoothies. Making organic green smoothies really was like magic for my health and energy. I was feeling incredible and when you feel good you naturally want to share. My partner Jake and I realized there was a need in the market for real superfood smoothies and high quality organic juices you can grab and go. Tell us about LoveGrace Foods. What inspired the idea and what is your vision for the company? We are inspired by a world that people are excited about, living a life they absolutely love and fulfilling on their dreams. We believe a nourished body is the first place to start. We envision people all over having the option and accessibility to a super nutrient rich high vibration Love Grace juice along side the sodas and pasteurized sugar waters at their local grocery store. What strategic partnerships/marketing strategies have you implemented that have attributed to LoveGrace's success? Love Grace is an organic extension of our lifestyle so every partnership has to be authentic. We started by selling juices in a friend's yoga studio for example and it went like wildfire from there. Jake has been skateboarding for years so it was natural to share with fellow skaters and partner with pro-skaters. Also we are inspired by the "rewilding" movement pioneered by Daniel Vitalis so connecting with leading health professionals like him and people contributing to the health of the planet feels right. It's all in alignment with what we love and we use our blog, social media networks, and relevant events to share our products and educate people about a healthy lifestyle. More and more cold-pressed juice is showing up on the scene. We always say if there can be a pizza shop on every corner there can absolutely be more green juice. However all juice isn't created equal. People are busier than ever, have access to more information than ever before in history and are tuned in to the benefits of a healthy body. Yoga and fitness continue to grow as well and partnerships with these types of businesses are a perfect compliment, with wholesale inquiries coming in daily. We are not just a juice company, we are a healthy lifestyle company so we look for the trends that compliment this mission. Quality organic food is another non-stop trend that we love to partner with at new cafes, restaurants, and markets that share the same commitment to quality foods. Between both jake and I it would be something like this: Feet in the dirt. When you do what you love the world is better. Embrace the divine organization of all things. Even when things seem imperfect trust that they are perfectly aligned for your greatest and highest good. A nourished person does the most good. Wild love and self-expression. Your greatest success as Founder/CEO of LoveGrace? Most difficult moment-how did you overcome and what did you learn? Greatest success...every time someone drinks a bottle of Love Grace we are successful. We were able to create drinks that we believe unleash peoples superhuman powers and they are out in the world. Yeah..every moment is a success. Challenge would be when we were starting out and decided it would be great to live in the office above the facility. A hurricane came and knocked out the hot water heater so for about 6 NY winter months we lived in a frozen cement building, making and delivering juice every day, every moment a labor of love. We learned what we are capable of and when you are in service to others you can do anything with joy. Just do it. Don't think about it. Don't get caught up in the details. Describe the ideal experience using a Love Grace product. Cracking open a bottle, feeling absolutely refreshed and presenced by the nutrient dense drink filling your senses. Then smiling and energetically going on to do what you love. The ideal experience from completing one of our juice cleanses is feeling bright, focused and full of life. It’s a great jumpstart to a healthy lifestyle. One of our favorite testimonials is from a yoga teacher “Max” 40 years old active and healthy but had Chronic Fatigue for years. Since the age of 20 she needed to take a nap every single day. Her family nick named her “sleepy.” The first day of her Love Grace juice cleanse was the first day she didn’t need a nap! It was the missing link for her energy levels and now she is on the juice regularly. Having energy to be full in your life and present with those you love is part of our mission. Most popular drinks and your favorites? The Purify a blend of raw coconut water and green juice. Also the Green Protein smoothie is so popular and of course our seasonal Organic Watermelon Cleanser. People freak out about it when we make it available each summer. You really feel like you're drinking "sunlight in a bottle." My favorites are Longevity, Chocolate Superfood and Invigorate. Having them share in our mission of creating health on the planet is a big one. When we know we are working for something way bigger than ourselves people want to do what they are doing. French Fries and a Love Grace Longevity Tonic. Betsey Johnson. I'm blessed to have worked closely with her for years and have always admired her bad assness. Her ability to do what she loves, inspire so many people to feel great, and be completely expressed. Whenever I think I need to wear a suit or some sort of professional outfit I immediately remember Betsey as an incredible business woman wearing whatever she wants, including leopard pants or tutus. It's really about being true to yourself. 6am hot yoga. Jake's current passion is Ju jitsu. Costa Rica or Tepotzlan Mexico. Pretty much anywhere we can be on the land, in the sunshine and where the energy feels sacred and sweet. What's next for LoveGrace Foods? We're expanding every day into more retail locations. In the future we see a flagship location really an expression of the Love Grace Lifestyle and also opening up our line to include more high vibe foods.